We’re so excited to add another San Diego Happsters Squad to the mix! This one is based out of Carlsbad (North County San Diego) and we’re thrilled to have 20 amazing women join leader Alisha Phipps for the start of their squad. 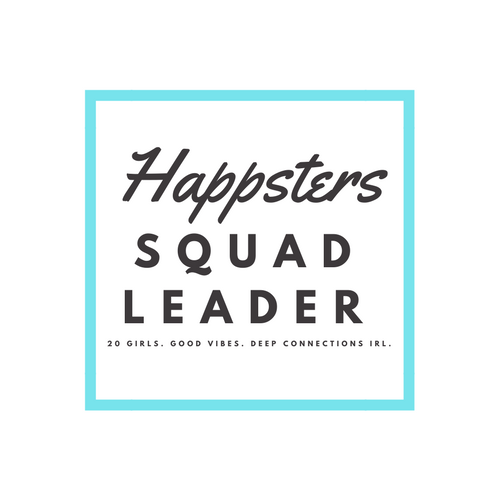 If you’re new to the party and haven’t heard about Happsters Squads, here’s a little bit about them: Happsters Squads bring together women who live in the same city to practice the 4 G’s of happiness together: Gathering, Gratitude, Growth and Giving. You can learn all about it and join one near you here. Horseback riding, dancing to live music and flowers. I’ve been totally obsessed with @Almost30Podcast. I think I’ve turned every one of my friends onto it! Lindsay, Krista and all their amazing guests have taught me so many tricks to navigate all of life’s transitions but especially from 20s to 30s, health, wellness and self-development. I’m currently doing it! – working in Patient Engagement at a leading medical device company. I don’t watch TV very much but I love a good Netflix documentary (need some new suggestions) and I’m obsessed with ‘This is Us’ and ‘Big Little Lies’. 5. What are your favorite things to do in your city? There is SO much to do in San Diego. I love a Saturday morning stroll through Little Italy farmers market, followed by brunch at Queenstown Public House. In North County, I can’t get enough of LTH (Local Tap House) or Campfire, fun night with friends dancing and singing at Belly Up and the beautiful beaches that somehow remain fairly uncrowded during the touristy seasons. This is really hard one! It’s not really a secret but I’m pretty really creative and artistic – I love doing craft projects, home improvement design work, making and designing things from scratch. One of my 2018 intentions was to make something creative/crafty each month to more fully tap into this talent. “Accept what is, let go of what was, believe in what will be.” This affirmation lifted me up during a really difficult time in my life. I still recite it and appreciate its applicability to many different situations. At the beach, listening to the waves, soaking up the sun.